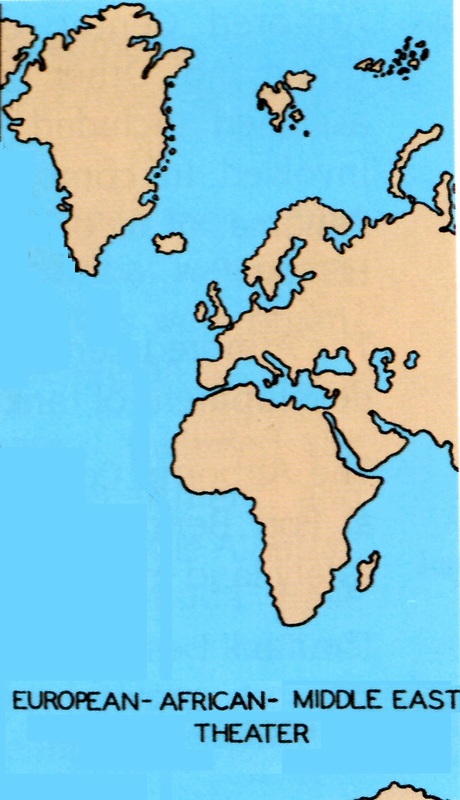 The European African Middle Eastern Theater of operations is shown above. Every United States military service member that served in the European African Middle Eastern Theater of operations between December 7, 1941 and March 2, 1946, earned the European African Middle Eastern Campaign Medal. For each Campaign the veteran served in they earned a Bronze Campaign Star on their ribbon for every 5 Campaign they earned a Silver Campaign Star. These campaigns were; EGYPT-LIBYA, ALGERIA-FRENCH MOROCCO, TUNISIA, SICILY, NAPLES-FOGGIA, ANZIO, ROME-ARNO, NORMANDY, NORTHERN FRANCE, SOUTHERN FRANCE, NORTH APENNINES, RHINELAND, ARDENNES-ALSACE, CENTRAL EUROPE, and PO VALLEY.